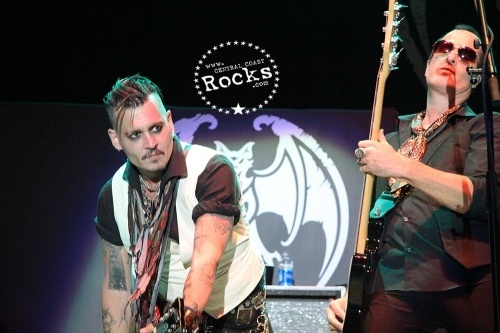 Hollywood Vampires sink their teeth into Paso Robles! 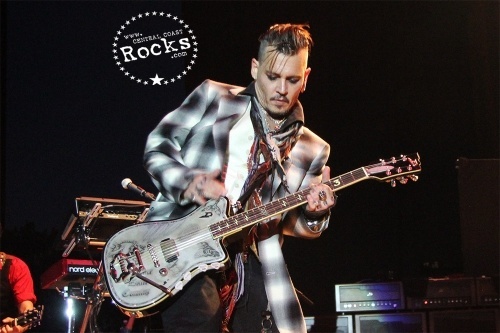 The All Star group fronted by veteran rocker Alice Cooper & actor Johnny Depp, also includes Aerosmith’s Joe Perry, former Guns N’ Roses/Velvet Revolver drummer Matt Sorum and Stone Temple Pilots bassist Robert DeLeo. 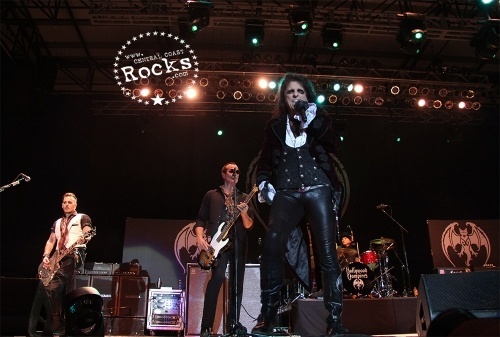 The Hollywood Vampires invaded the California Mid State Fair in Paso Robles and temperatures that reached into the triple digits was not even enough to slow this supernatural group of all stars down as they were out for blood the moment they hit the Chumash Grandstand stage. 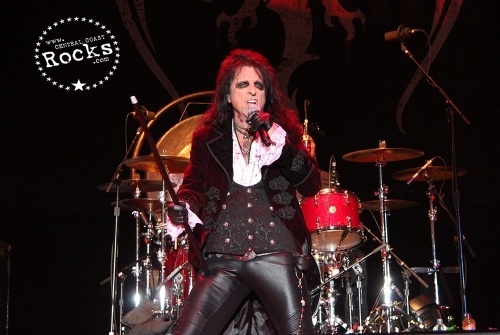 Although their set consisted primarily of cover songs, the band’s original opening song “Raise The Dead,” excitedly set the tempo of the night which paid homage to fallen rockers we have lost over the decades. 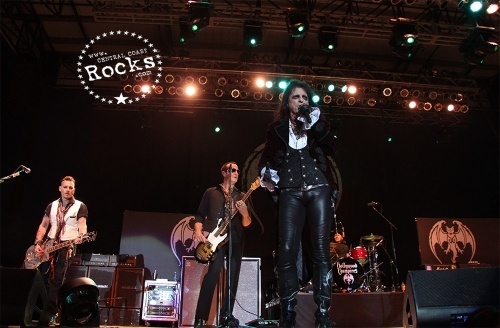 Former Guns N’ Roses/Velvet Revolver drummer Matt Sorum and Stone Temple Pilots bassist Robert DeLeo provide the rhythm section and regular Cooper band guitarist Tommy Henriksen along with keyboardist-guitarist Bruce Witkin round out the group. My Dead Drunk Friends,” another original off the band’s self- titled “Hollywood Vampires” CD released last year more than held up to the rest of the cover set list which included Motorhead’s “Ace of Spades,” and The Who’s “My Generation.” The song pays tribute to the Vampire’s setlist and album’s songs of deceased rockers. 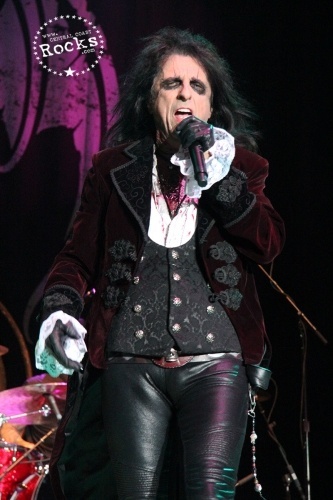 Cooper’s voice really hit its stride when the band closed out the night with spirited versions of Alice’s classics “I’m 18,” and “Schools Out” amid a New Year’s Eve like balloon drop celebrating the last night of this tour. Here’s hoping we don’t lose any more Rock & Roll icons this year but if we do you know the Hollywood Vampires will pay homage with class & dignity all the while having a rocking good time. After all, Vampires are immortal right ? In 1972, on the Sunset Strip at a club called the Rainbow Bar & Grill, the Hollywood Vampires were born in the upstairs bar. 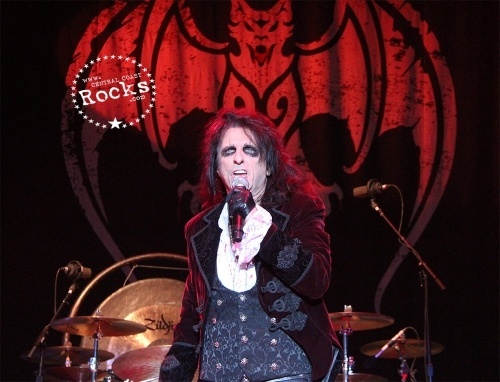 It was a gathering place for the rock stars living in or passing through L.A. "To join the club, one simply had to out drink all of the members," says Alice Cooper, a founding member of the Vampires. "I would walk in on a typical night," Alice says, "and John Lennon, Harry Nilsson, Keith Moon - who would usually be in a costume like a maid or a chauffeur - Bernie Taupin, Jim Morrison and Mickey Dolenz would be there. The next week might be Bernie Taupin, Jimi Hendrix, Jim Morrison and Mickey Dolenz." 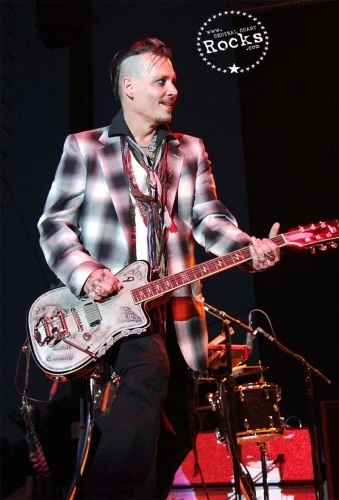 Three years ago, Alice and good friend Johnny Depp got together and decided the spirit of the Hollywood Vampires should live again (minus the drinking). An environment for great artists to hang, laugh and play together. 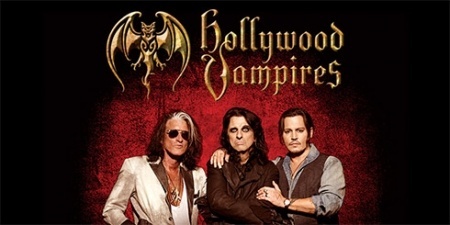 The Hollywood Vampires live again with the release of the Hollywood Vampires' new album. 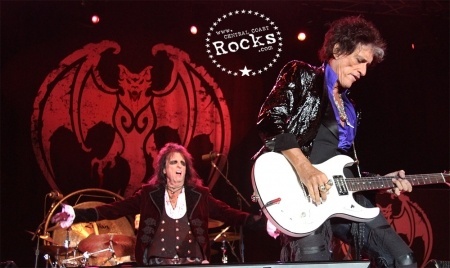 Alice and Johnny were joined by Joe Perry, who is an old friend of both of them, and the recording began: a tribute to the original Hollywood Vampires.